How to quickly and easily design and deploy a WordPress website in a few simple steps! Learn how to deploy InstantWP websites straight onto a live web server. Learn how to migrate an existing WordPress website into InstantWP for developing and testing. This guide will help you save time, make more money and have happier clients all by utilising the full power of InstantWP. If you work with WordPress, you need this! Discover an easy solution to deploying to and from InstantWP starting from today! Design your website on your own Windows or Mac machine and duplicate your entire InstantWP installation onto a web server in a few minutes, quickly and easily. Take a snapshot of a live WordPress website and duplicate it in InstantWP to test it for WordPress upgrades. Design a WordPress website in InstantWP and clone it multiple times across the web. Give your clients a “training sandbox” of their live WordPress site in InstantWP so that can learn how to use WordPress without damaging their live website. Clone your live WordPress website for use in presentations and exhibitions in places where you don’t know if there will be Internet access. Learn how to secure a migration from InstantWP from hacking. Step by step instructions on deploying to and from InstantWP. A set of concise video tutorials covering InstantWP deployment. Videos are provided as a download so you can watch them offline. License to Re-Distribute to Clients or Students. InstantWP Unleashed Has Guided Thousands of Users. Get Your Copy Now. Step by step instructions on deployment. Set of Downloadable Video Tutorials. Videos are concise and thorough. Please note for EU residents: Quoted price does not include VAT. This will be added at the checkout stage. 30 Day Money Back Guarantee. No Quibbles. I give a 30 day money back guarantee. No quibbles. If you are dissatisfied with your purchase for any reason, you will receive a full refund if you contact me within 30 days of the purchase of this product. See what our users think! Thank you so much for this really excellent software - and for your generosity in making it freeware. It is so simple to use and the fact that it runs so easily from a usb stick makes it especially useful. The addition of InstantWP Unleashed makes working with WordPress on localhost and then going live a doddle! After reading through the Ebook and checking out the videos, I am very impressed with how well the topics are explained. You include the most basic details, but also smoothly move into the more advanced areas with easy to follow instructions. I purchased InstantWP Unleashed yesterday and had a chance to go through the manual last night. I was really impressed with the step-by-step instructions and how thorough they were... If you have a WordPress Blog then you need this even if you only use it to backup and restore your websites. After reading through the manual, it was a step-by-step guide with lots of illustrations. There was a bunch of plug-ins he showed that I've never seen before which I will be using to change out config files and vulnerable areas of the security. Seamus has it laid out pretty easy so anyone can follow along. I thought I had a pretty good knowledge of WP. I guess I've just been schooled! For someone, like myself, who knew zero about creating a website, InstantWP was an excellent way to begin. In 2012 I was able to install InstantWP and began learning how to use WordPress in a matter of hours. At that time, I had no Internet host or domain and knew nothing about how to upload a local site. "InstantWP Unleashed" was absolutely critical for me to figure out how to accomplish a migration. It is now 2017 (5 years from starting) and I have six websites all using InstantWP for backup, development, and testing. I almost never modify my websites on the Internet. Another great advantage of InstantWP is being able to simply copy a site into a new folder to use for testing. If testing is successful, then it becomes the new version of the local site... I have now converted each of my local sites from InstantWP 4.3 to 5.3 using the procedures in section three of "InstantWP Unleashed"... A happy InstantWP user! Question - Do I need to buy this to use InstantWP? No, InstantWP is open source and free and will remain so. InstantWP Unleashed is an extra product that will save you time and money. InstantWP Unleashed keeps InstantWP free! Question - Do I need to buy software to use InstantWP Unleashed? No! The techniques taught in this guide use free open source tools. Competing products for moving WordPress websites can often cost $100 or more. Competing products for moving WordPress websites can be restricted to a certain number of sites. Once you learn the techniques in this guide, you can use them as often as you wish. There are no restrictions on using InstantWP to deploy websites. Few products in the market allows you to create a copy of your WordPress installation for testing or demonstration. Think how impressed your clients will be to have their very own tailored training environment! Question - What does the InstantWP Unleashed PDF EBook contain? Chapter 1 – Tools and Tips for a WordPress Professional. Chapter 2 – How To Use InstantWP Like A Power User. Chapter 3 – How to create an InstantWP duplicate of an existing WordPress Website. Chapter 4 – How to move an InstantWP installation onto the Web. Chapter 5 – How to Secure an InstantWP installation after moving it onto the Web. Chapter 6 – Troubleshooting Your InstantWP Migrations. Question - What videos are included in InstantWP Unleashed Premium? How to install the Duplicator plugin in an existing WordPress installation. How to create a package and installer using the Duplicator plugin. How to delete all WordPress content from InstantWP. How to upload a Duplicator package and installer into InstantWP. How to move an InstantWP installation onto the Web. How to install the Duplicator plugin into InstantWP. How to create a Duplicator package inside InstantWP. How to create a MySQL database using CPanel. How to use the SFTP Client on Windows. How to use the SFTP Client on macOS. How to run the Duplicator installer on your web server. Question - What rights do I get with InstantWP Unleashed Business? 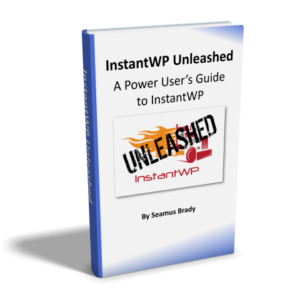 You can give a copy of InstantWP Unleashed to your clients as an add-on or extra to complement your own products or services. You may not repackage InstantWP Unleashed under your own business name though. You may not re-distribute InstantWP Unleashed on the public internet.